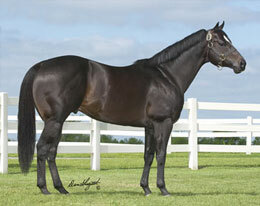 Ivory James sired the sixth fastest qualifier to the Grade 3 Harrah's Futurity on Saturday at Louisiana Downs. BOSSIER CITY, LA�MARCH 4, 2017�Royal Vista Ranches' stallions IVORY JAMES and DOMINYUN each sired a finalist to the Grade 3 $233,578 Harrah's Futurity Saturday afternoon at Louisiana Downs. The 10 fastest, from 71 juveniles making their career debut in eight trials on Saturday, will return to the Northwest Louisiana racetrack on Wednesday, March 22nd to vie for the $105,110 winner's purse in the 300-yard final. Emnent, a DOMINYUN gelding racing for owner/ breeder Bobby D. Cox, kicked off the day with a win in the opening trial under jockey Donald Watson. Conditioned by trainer Kenny Roberts Sr., Emnent entered the race off the fastest Harrah's schooling race time run on February 10. Cox bred Emnent from the Corona Cartel mare Bodacious Dream. His clocking of :15.916 for 300 yards was the 10th fastest of the day. Shades Of Gray, another Cox-bred 2-year-old, finished second in the second trial to get the 6th fastest time of :15.856 seconds. Trainer Javier Contreras conditions the IVORY JAMES gelding for owner Jose Guadalupe Rodriguez. Roman Huetra rode the colt out of Verrsace by Ocean Runaway. For the complete list of Harrah's Futurity qualifiers, times, sires, dams, owners, breeders, trainers and jockeys CLICK HERE.